For adults and children, different methods are used to find out if weight is about right for height. If you are an adult, follow the directions in the picture below to evaluate your weight-for- height, or Body Mass Index (BMI). Not all adults who have a BMI in the range labeled “healthy” are at their most healthy weight. For example, some may have lots of fat and little muscle. A BMI above the healthy range is less healthy for most people; but it may be fine if you have lots of muscle, a large body frame, and little fat. 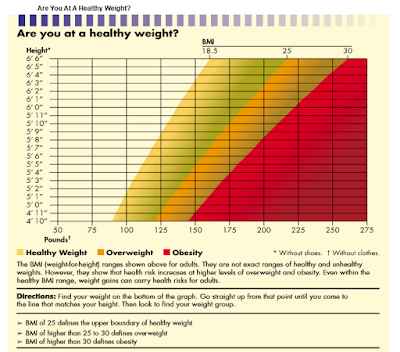 The further your BMI is above the healthy range, the higher your weight related risk. If your BMI is above the healthy range, you may benefit from weight loss, especially if you have other health risk factors. BMIs slightly below the healthy range may still be healthy unless they result from illness. There is no single perfect body size for children. However, many children are overweight. If you have concerns about your child’s body size, talk with your health care professional. Keep track of your weight and your waist measurement, and take action if either of them increases. 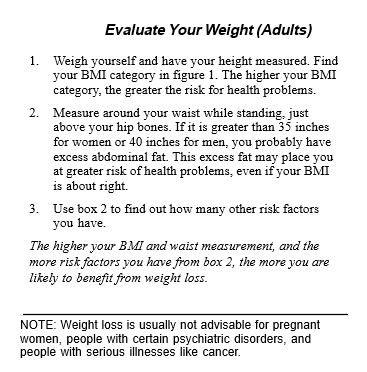 If your BMI is greater than 25, at least try to avoid further weight gain. If you are middle aged or elderly and your waist measurement increases, you are probably gaining fat and losing muscle. If so, take steps to eat less and become more active. Our genes affect our tendency to gain weight. A tendency to gain weight is increased when food is plentiful and when we use equipment and vehicles to save time and energy. Plentiful food and labor-saving devices can make it very difficult to avoid weight gain, but it is possible to manage your weight through your food and physical activity choices. To make it easier to manage your weight, make long-term changes in your eating behavior and physical activity. To do this, build a healthy base and make sensible choices. Choose a healthful assortment of foods that includes vegetables, fruits, grains (especially whole grains), skim milk, and fish, lean meat, poultry, or beans. Choose foods that are low in fat and added sugars most of the time. Eating mainly vegetables, fruits, and grains helps you feel full, achieve good health, and manage your weight. Whatever the food, eat a sensible portion size. Try to be more active throughout the day. To maintain a healthy weight after weight loss, it helps for adults to do at least 45 minutes of moderate physical activity daily (at least 60 minutes daily for children). Over time, even a small decrease in calories eaten and a small increase in physical activity can keep you from gaining weight or help you lose weight. High-fat foods contain more calories than the same amount of other foods, so they can make it difficult for you to avoid excess calories. However, low fat doesn’t always mean low calorie. Sometimes extra sugars are added to low- fat muffins or desserts, for example, and they may be very high in calories. Your pattern of eating may be important. Snacks and meals eaten away from home provide a large part of daily calories for many people. Choose them wisely. Try fruits, vegetables, whole grain foods, or a cup of low-fat milk or yogurt for a snack. When eating out, choose small portions of foods. If you choose fish, poultry, or lean meat; ask that it be grilled rather than fried. Like younger adults, overweight and obese older adults can improve their health by losing weight. The guidance of a health professional is recommended for obese children and older adults. Since older people tend to lose muscle and replace it with fat, regular weight-bearing physical activity is a valuable part of a weight-loss plan. Building or maintaining muscle helps keep older adults active and reduces their risk of falls and fractures. Staying active throughout your adult years helps maintain muscle mass and bone strength for your later years. If you are overweight, loss of 5 to 15 percent of your body weight is likely to improve your health, ability to function, and quality of life. Aim to lose about 10 percent of your weight over about 6 months. This would be 20 pounds of weight loss for someone who weighs 200 pounds. Loss of 1/2 to 2 pounds per week is usually safe. Even if you have regained weight in the past, it’s worthwhile to try again. However, your health is more likely to improve over the long term if you achieve and maintain a healthy weight rather than lose and regain many times. Staying at a healthy weight requires healthy eating habits and physical activity as a regular part of your life. Children need enough food for proper growth, but too many calories and too little physical activity lead to obesity. The number of overweight world children has risen dramatically in recent years. Encourage healthy weight by offering children grain products; vegetables and fruits; low-fat dairy products; and beans, lean meat, poultry, fish, or nuts—and let them see you enjoy eating the same foods. Let the child decide how much of these foods to eat. Offer only small amounts of foods high in fat or added sugars. Encourage children to take part in vigorous activities (and join them whenever possible). Limit the time they spend in sedentary activities like watching television or playing computer or video games. Take care when helping overweight children to develop healthy eating habits. Make small changes. For example, serve low-fat milk rather than whole milk and offer one cookie instead of two. Since children still need to grow, weight loss is not recommended unless guided by a health care professional. Frequent binge eating, with or without periods of food restriction, may be a sign of a serious eating disorder. Other signs of eating disorders include preoccupation with body weight or food (or both—regardless of body weight), dramatic weight loss, excessive exercise, self-induced vomiting, and the abuse of laxatives. 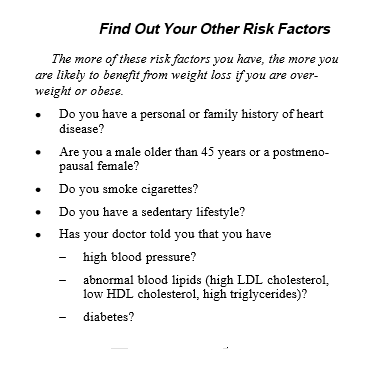 Seek help from a health care professional if any of these apply to you, a family member, or a friend. Aim for a healthy weight. If you are at a healthy weight, aim to avoid weight gain. 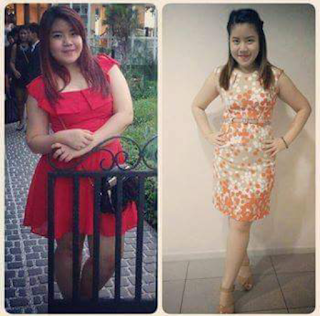 If you are already overweight, first aim to prevent further weight gain, and then lose weight to improve your health. Build a healthy base by eating vegetables, fruits, and grains (especially whole grains). If you eat these foods with little added fat or sugar, they will help you feel comfortably full without a lot of calories. Select sensible portion sizes. In addition, get moving. That is, make sure you get regular physical activity. Set a good example for children by practicing healthy eating habits and enjoying regular physical activities together. Keep in mind that even though heredity and the environment are important influences, your behaviors help determine your body weight.